Update from any previous paid version is free. 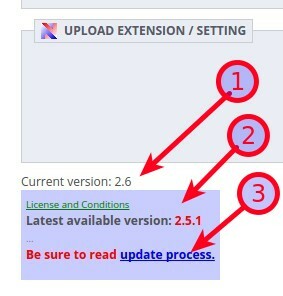 If Your current version (1) is less than available version (2), You can download new version. You can download module update from Your account / orders detail, or contact me with Your registration email and with Your order number. New version will be sent to Your registration email. Go into list of modules (1), add new module (2), select new version (3) and upload (4). Do not uninstall module, if You uninstall, Your setting will be lost! Simply upload module in Your BackOffice. Important: After upload new version, go into module configuration and check the settings and “Save settings”. After reinstall import back Your saved settings. ********* Send to email – possibility change email subject. Support “XML tags” names. Mám od Vás nakúpený modul Export Orders pre Prestashop a jeden z našich dodávateľov si chce zmeniť dodanie objednávok vygenerovaného CSV a to nasledovne. Po prípadne Vám vzor môžem odoslať na aktuálnu emailovú adresu len mi prosím odpíšte na akú emailovú adresu mám odoslať. Moja otázka je v module Export Orders je už taká možnosť myslím niekde to odfajknúť alebo je to potrebne nejak nastaviť NVN Export Orders — POLE ak treba nastaviť POLE tak ako ? Za ochotu a pomoc vopred ďakujem. odpovídal jsem 6.6. 16. V příloze jsem posílal i novou verzi modulu, tak jestli to kvuli tomu neskončilo ve spamu. v modulu je pole “Total shipping tax incl” a “Total shipping tax excl”. Pokud tam ty pole nemáte, tak máte starší verzi, tak v minulé příloze jsem posílal tu poslední verzi. I was wondering if there is a chance to have more than 5 presettings which can be used to create exports? We have export running based on the weekday and corresponding status (shipped monday, shipped tuesday, and so on) and it would be very helpful to have more presettings available. Even better would be to have the chance to name these settings individually. yes, it is possible setup up to six configuration setting. Each setting can export independently from other. Using Cron or manual switch in module. Great! I see in your last version 2.7.5 a lot of improvements, e.g. customizable names for the presettings. I just noticed one rare result when exporting reports as xlsx file. What I have noticed is, that in some reports fieldsshow a random number of the same entry (e.g. for the field “order status” there are rows with “ShippedShippedShippedShippedShipped”, others with “Shipped” and another ones with “ShippedShippedShipped). This even is visible with order ids, e.g. Any idea why this could happen and what I need to change? Yes, in latest version you can use up to 9 named settings. You can try switch to excel 5 xls format or csv? Thank you for the quick response. I tried both XLS and CSV and the bug appeared again. For some reason, the bug still appears exactly with both formats. Any idea where to start? Should we ask our developers to debug? Probably it is something specific in your installation. I send You my email in e-mail. Where can I download this module?